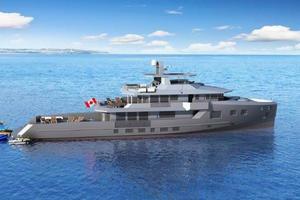 All Ocean Yachts is pleased to announce the design release of its latest Explorer Yacht, the All Ocean 133’ (40.5m.) Bray Design, AH (All Hemispheres) OCEAN ROVER Explorer Yacht. Bray Yacht Design utilized their awarding winning high efficiency hull design and created the basic design and layouts, then a team approach was employed to refine all aspects of the vessel to assure it exceeds the mission parameters of a worldwide exploration and charter vessel capable of operations in all hemispheres. 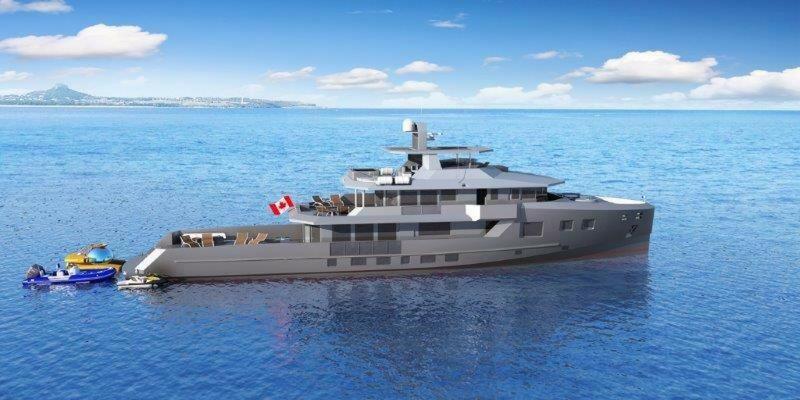 The team members involved are Pat Bray of Bray Design, John DeCaro of All Ocean Yachts, Winston Clarke ex-captain of Bigfish, Michael Kirschstein of Kirschstein Design and David Darwent, D2 Project Management. The team brings a superb balance of design expertise and practical experience to the design and build that is rare to find. This team created a highly seaworthy, low maintenance and operating cost vessel with features that you rarely see in a vessel in this size range. The AOY AH OCEAN ROVER is a highly flexible platform that can be configured to meet a host of different uses, extended cruising, remote exploration, scientific work and worldwide charter operations in All Hemispheres. Some of the AH OCEAN ROVER’S exceptional features are the extensive use of glass to create an atmosphere that allows the owner and guest to always be interactive with the environment they are in. The primary layout has an owner’s deck behind the wheelhouse that allows for stunning views from all areas of the owner’s suite. In addition they have a large private aft deck that can be configured to their requirements, from lounging to workout area. The aft deck overlooks the massive tender deck which can accommodate a wide variety of boats and toys. 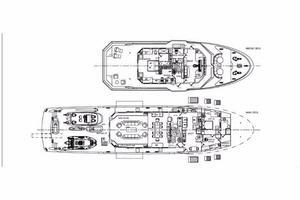 The deck can comfortably fit a primary tender of up to 32’ (9.5m), secondary tender up to 24’ (7.3m), a number of small water craft or a submarine and smaller tenders. 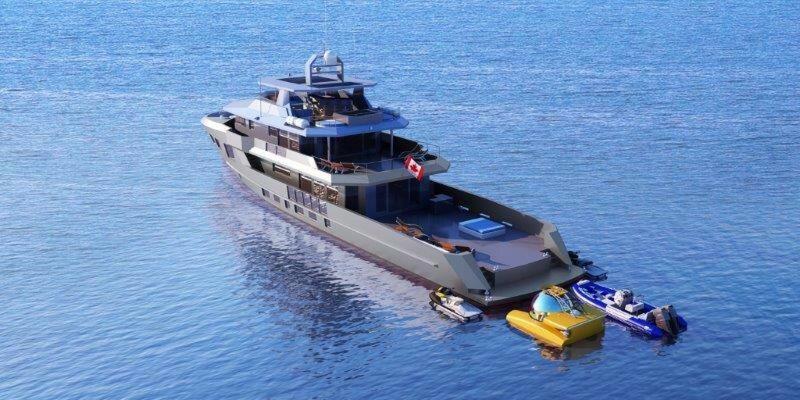 In addition to all of the flexibility of watercraft selection, the deck can also accommodate a helicopter landing pad. When the watercraft are all deployed, the boat deck is transformed into a huge beach with easy water access plus there are fold down glass balconies to port and starboard that all relax out over the water. In addition to the multi use main deck space there is an expansive flybridge dedicated to guest relaxation in all weather conditions. The Flybridge has a large dining area and bar and there is a forward sun pad and seating, all of which are positioned to take advantage of the stunning vistas available from this area. At the aft section is a large hot tub and raised sun pad. The main section of the flybridge is covered by a hard top and can be heated or cooled as required for use in all hemispheres. This is a dedicated relaxation zone, where guest will say “AH” as they enjoy its many features. In addition to the flybridge seating there is a comfortable foredeck seating area. The main saloon incorporates large windows with a transforming use interior where the formal dining zone changes into an entertainment area. The glass fold down bulwarks combined with the low lounging area to bring forth an un-interrupted view of exotic land and seascapes. The lower deck features four large guest cabins with extra large port lights to provide enhanced natural light and viewing. The AOY AH OCEAN ROVER’S mission profile demands that she has exceptional crew accommodations to handle the extended passage and remote area operations. The OCEAN ROVER can be operated in traditional cruising areas with smaller crew. 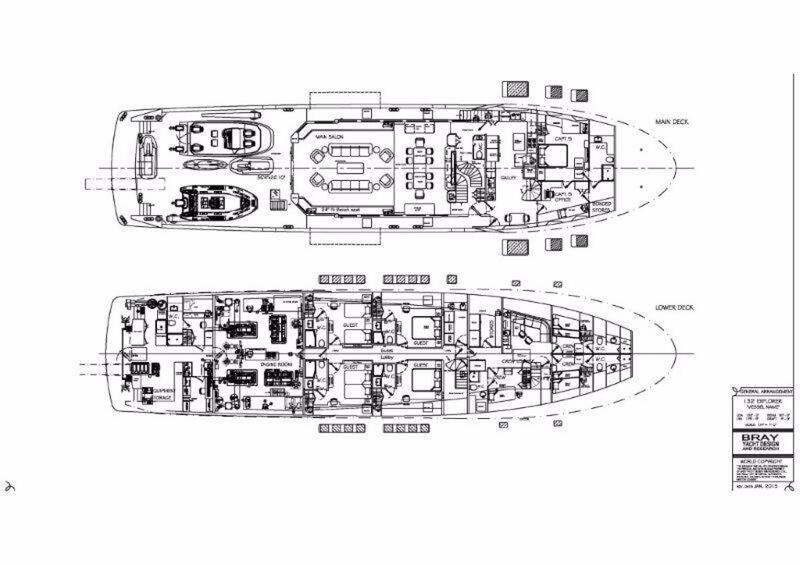 However she has been designed to accommodate all of the additional crew members that are necessary and often not considered during design when creating a world exploration vessel, such as dive instructors, fishing guides, pilots, nannies, instructors and others. The whole design team is dedicated to making all aspects of operation efficient and “GREEN” by incorporating proven technologies and cutting edge developments. The OCEAN ROVER will incorporate extensive solar cells and shaft generators with the new TESLA battery power supply system to reduce the generator sizes and enhance operation of the vessel in a wide variety of operating parameters. United Yacht Sales Emerald Coast would love to guide you through a personal showing of this 132' Custom Bray Ocean Rover 132 2021. 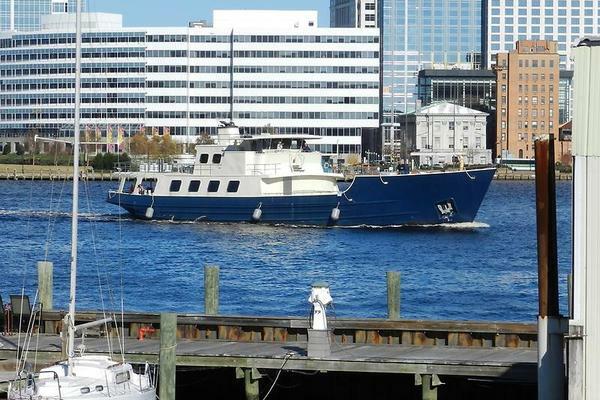 This yacht for sale is located in Unknown, Florida and priced at $17,029,038. For a showing please contact us by filling out the form on this page and we will get back to you shortly! 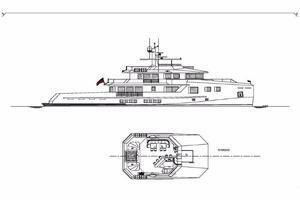 All Ocean Yacht is pleased to announce the design release of its latest Explorer Yacht, the All Ocean 133’ (40.5m.) Bray Design, AH (All Hemispheres) OCEAN ROVER Explorer Yacht. Bray Yacht design utilized their awarding winning high efficiency hull design and created the basic design and layouts, then a team approach was employed to refine all aspects of the vessel to assure it exceeds the mission parameters of a worldwide exploration and charter vessel capable of operations in all hemispheres. The team members involved are Pat Bray of Bray Design, All Ocean Yachts, Winston Clarke ex-captain of Bigfish, Michael Kirschstein of Kirschstein Design and David Darwent, D2 Project Management. The team brings a superb balance of design expertise and practical experience to the design and build that is rare to find. This team created a highly seaworthy, low maintenance and operating cost vessel with features that you rarely see in a vessel in this size range. Among many of the AH OCEAN ROVER'S exceptional features is the extensive use of glass to create an atmosphere that allows the owner and guests to always be interactive with the environment they are in. The primary layout has an owner’s deck behind the wheelhouse that allows for stunning views from all areas of the owner’s suite. 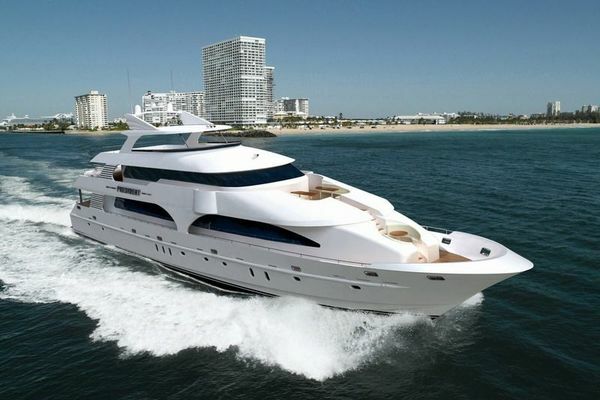 In addition they have a large private aft deck that can be configured to their requirements, from lounging to workout area. The aft deck over looks the massive tender deck which can accommodate a wide variety of boats and toys. 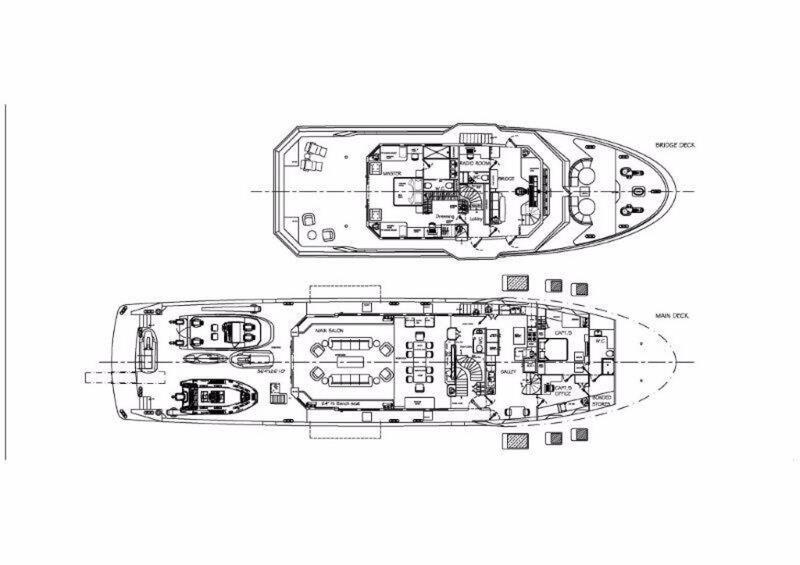 The deck can comfortably fit a primary tender of up to 32’ (9.5m), secondary tender up to 24’ (7.3m), a number of small water craft or a submarine and smaller tenders. 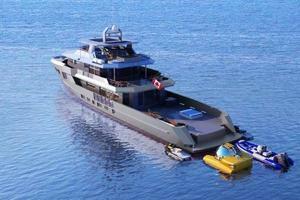 In addition to all of the flexibility of watercraft selection, the deck can also accommodate a helicopter landing pad. When the watercraft are all deployed the boat deck is transformed into a huge beach with easy water access, plus there are fold down glass balconies to port and starboard that all relax out over the water. In addition to the multi use main deck space there is an expansive flybridge dedicated to guest relaxation in all weather conditions. The flybrige has a large dining area and bar and there is a forward sun pad and seating, all of which are positioned to take advantage of the stunning vistas available from this area. At the aft section is a large hot tub and raised sun pad. The main section of the flybridge is covered by a hard top and can be heated or cooled as required for use in all hemispheres. This is a dedicated relaxation zone, where guest will say “AH” as they enjoy its many features. In addition to the flybridge seating there is a comfortable foredeck seating area. The main saloon incorporates large windows with a transforming use interior where the formal dining zone changes into an entertainment area. The glass fold-down bulwarks combine with the low lounging area to bring forth an uninterrupted view of exotic land and seascapes. The hull shall be of "Marine Grade steel and the superstructure shall be constructed of “Marine Grade” aluminum alloy. The superstructure joint will be Tri-clad or similar. Weld seams on the exterior are to be smoothed where needed before being faired over. All practical means will be taken to reduce distortion in any of the plates. This will be done by the use of proper weld sequencing, temporary strong backs, permanent panels, stiffeners, etc. All steel cut by shall have its edges which will not be welded ground to an approximate 3mm radius as soon as practical after being cut and before being welded into the structure. Where practical, the edges shall be primed using Builder’s standard primer. Sand blast and zinc paint tank tops, sides and bilges to waterline in guest and master stateroom compartments. FRAMING The vessel shall be longitudinally framed throughout. The vessel’s framing shall be of the transverse system throughout. The structure shall consist of steel plating and shapes as required to meet A.B.S.design requirements for vessels of this type. Stanchions and supports will be provided where required to support concentrated loads, deck machinery, etc. Swash plates will be furnished in tanks where required to minimize free surface effect of fluids in the tank. Limber and vent holes shall be provided to assure proper drainage and eliminate entrapment of air and liquid pockets. Transverse frame spacing shall be on 500mm (19.68") centers. The hull bulkheads shall be arranged as shown on the contract drawings and shall be of steel corrugated plate, or the bulkheads shall have properly sized stiffeners to comply with A.B.S. standards. All penetrations through watertight bulkheads shall be installed strictly in accordance with A.B.S. requirements. Shall be to specifications and meet or exceed A.B.S. requirements. Where deck stiffeners are eliminated due to deck openings the stiffeners shall be headed with properly sized members. 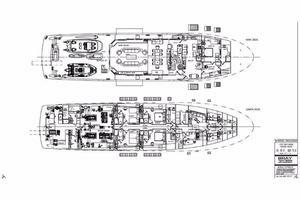 The hull shall incorporate integral steel tanks for fuel, water and other liquids as specified. Access manholes shall be fitted on tank tops, or tank sides if tops are not practical, of the fuel tanks to facilitate inspection and cleaning. All other tanks will have manholes on the top or sides if top location is not practical. Location of manholes is to be such that it does not detract from the decor in accommodation spaces as per Designer’s drawings. Vents above deck level for all tanks to be 316l stainless steel. Per section 4.19 tanks to have sight glasses or dipstick and electronic monitoring. The girders for the main engines shall be designed to be a structural member of the hull with sufficient strength and rigidity. The engine girders shall extend as far forward and aft as practicable and shall be well braced athwartships to ensure that maximum working stresses shall be evenly transmitted to the hull. IN GENERAL, the following sizes and thickness shall be used in the hull construction, shall be to Designer'sspecifications and meet or exceed A.B.S. requirements. Where deck stiffeners are eliminated due to deck openings the stiffeners shall be headed with properly sized members. Shall be to Designer's specifications and meet or exceed A.B.S. requirements. Where deck stiffeners are eliminated due to deck openings the stiffeners shall be headed with properly sized members. A Bulbous bow shall be incorporated in to the design, with shape and size according to these vessels' characteristics. Bulb shall have swash plates and plating shall be equal to hull plating in area of bulb. Bulb to have 316L stainless or other agreed material strike strips on top. Bow Thruster 20”; Trac/American bow thruster or equal thruster, 100 HP, it is to be driven of the main engine gears with electric clutch. Quantum Marine Zero speed stabilizer system or similar sized as per manufacturer’s recommendation . A second pump shall be installed with one on each transmission. The Quantum system shall power the, stabilizers, windless, crane and deck winches. Head Hunter head system shall be installed complete with toilets, and all instruments and controls. All waste from the toilets shall be pumped to the appropriate black water tank. Headhunter black water treatment system installed, to process both black and gray water. The fuel oil system shall be comprised of approximately 21,500 gals in four (4) or five (5) tanks, two (2) main tanks, one (1) forward tanks, (1) day tank (1200 gals approx.) and one aft tank. Alfa Laval fuel system model MIB 303 shall be installed with drain to dirty oil tank. There shall be a reel hose tender filling system incorporated into the fuel system. One (1) ½ hp model 3C-2425252D air compressor with one (1) 2.5 gal reserve tank with water trap and drain, or equal. One (1) 18’ self-coiling hose with quick disconnect and fittings in engine room.